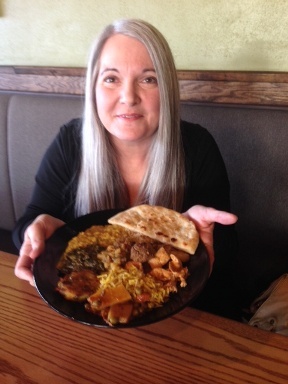 For today’s first, I visited Flavors International Cuisine, located at 32nd & Maiden Lane in Joplin. This Indian and Pakastani restaurant opened recently and I’ve been anticipating a meal here! Greg, who has never had Indian food, accompanied me. I love Indian food. Until now, I’ve had to travel to Springfield or Tulsa to enjoy this cuisine. I had high hopes for Flavors and I was not disappointed. The food is served buffet style. The restaurant is attractive and clean with plenty of seating. Before I even opened the doors, the tantalizing aromas welcomed me in. We enjoyed our lunch very much. The buffet had many of my favorites, including vegetable fritters, lentils, vegetable kabab, chicken curry, zeera rice and naan. I tried chicken biryani and meatball curry for the first time and loved both. The spinach and cheese dish was excellent also. Our server, Debbie, was attentive and friendly. And we got to meet the owner of Flavors, Mohammed. He came to our table to say hello and chat with us about his restaurant. I loved his outlook on being successful. His job is to do his best in preparing and offering wonderfully authentic foods to his patrons. Greg and I agreed, the food was delicious! I’m so glad Joplin has a restaurant offering a different selection of foods. I love variety. It truly is the spice of life, and when curry is one of those spices….yum! I’ll be visiting Flavors often.